With a car this apartment is perfectly located to access Bled, and surrounding cities. Lea and her family were incredibly hospitable and knowledgable on the area. Lea and her family were great! We received a very good welcome from her. Everything about the apartment was great. The bikes we had to grab breakfast or to go to lake Bled were surely a plus. We were offered a schnaps and pear's from the garden. This is the place to stay if you go to bled, just perfect! We felt very welcome and would stay again. A very clean and really tidy apartment. The host and her family were showed a very high level of hospitality, that we've never experienced before (Ie. : They offered us to use the vegetables and fruits were grown in their garden. Ensured two bikes free of charge, etc.) The apartment situated in a silent rustic environment. So it's ideal to enjoy the nature and relax. I can just suggest. Lea was really helpful and hospitable, especially upon arrival when we were tired and hungry after a late flight. The apartment is well-equipped with a kitchenette, plenty of towels in the bathroom and bikes, which we enjoyed cycling round the lake. Thank you for a lovely stay! Tidy and clean with all equipments we needed during our trip. Lea was so lovely. She brought us homemade cake and apple juice and gave us a lot of good tips for the area. There are so many really nice touches in the apartment that Lea has clearly done to welcome guests. It was easy to meet up with her to check in/out and she recommended a very friendly taxi service, connected us and let us know what to expect to be charged for the ride from the bus station. So helpful. The hosts have thought of everything at Apartment Hana, the apartment was very well equipped such as providing an assortment of different teas in the kitchen and bike helmets and a backpack for if you choose to borrow the bikes. We had a very relaxing and comfortable stay in the apartment, the centre of Bled was only a short cycle away. Everything was perfect! A lovely host, a clean apartment and a beautiful place to stay. It couldn't be better. Lock in a great price for Apartment Hana - rated 9.6 by recent guests. Apartment Hana is a self-catering accommodation located in Bled. FreeWiFi access is available. The property is 0.7 miles from Bled Castle and 0.9 miles from Lake Bled. Accommodation will provide you with a balcony, a patio and a terrace. There is a full kitchen with an oven and a refrigerator. Featuring a bath or shower, private bathrooms also come with a hairdryer and slippers. You can enjoy garden view. At Apartment Hana you will find a garden and barbecue facilities. The property offers free parking. If you feel like visiting the surroundings, check out The Bled Island (0.9 miles) and Bled Golf Club (5.6 miles).Ljubljana Jože Pučnik Airport is located 19.9 miles away. 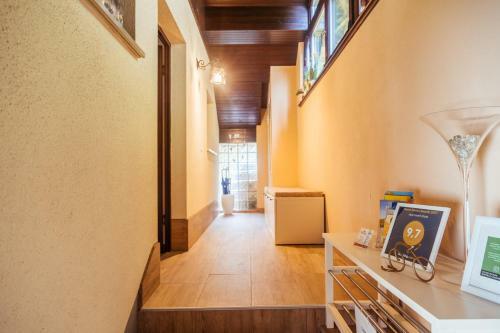 Apartment Hana has been welcoming Booking.com guests since 31 Jan 2015. When would you like to stay at Apartment Hana? This apartment has a patio, oven and balcony. Feel welcome and relaxed! The garden house offers a great meeting point and homeliness. The suite boasts a cosy atmosphere and comfortable furnishing that will make your stay in Bled even more memorable. Our family is renting out just one apartment on a quiet location, but not far from the town centre. Rečica is one of the oldest parts of Bled and is still very traditional. Quiet surroundings and an excellent starting point to discover Bled, Julian Alps and Slovenia. In the vicinity there are the Bled rowing centre, Bled Castle, the lake with the island, the Vintgar Gorge and the Pokljuka plateau in the surroundings. There are also many possiblilities for biking, walking and hiking. House rules Apartment Hana takes special requests - add in the next step! Please inform Apartment Hana in advance of your expected arrival time. You can use the Special Requests box when booking, or contact the property directly with the contact details provided in your confirmation. The street where the apartment is on is under construction between there and the main village of Bled which made walking the 10-15 minutes into town in the dark for dinner a little uncomfortable. It wasn’t that far but sometimes hard to want to go out again I’m the evening as we had to walk back to town in the dark or get a taxi. In the summer this may not be as much of an issue. Once the construction is done it looks like it will be quite a nice walking path which will help. Lea and her family were very friendly and helpful. The studio flat was well equipped and very comfortable. The location was ideal for us, a mature couple, in that it was frozen enough from the lake to be quiet but near enough for easy access. Nice arrangement, good equipment, everything you may need is available to you. Hosts are very nice and hospitable, they gave us hearty welcome and nice introduction to our stay. Bicycles which are available are very helpful during sightseeing. Only nice words can be told about this property.